Most of the schools in our region use Chromebooks, but we wanted technology that would grow with us—something with staying power in math and science, especially. To make the most informed decision. Students and families need to know what they’ll be getting, how it will be used, and what constitutes responsible behavior. Engage your school community (students, families, faculty, staff, Board) in the decision-making process so they can share the excitement. A district-wide technology initiative is expensive and time-consuming. Getting it wrong can set learning back years. So play it safe and test your tech before you buy. During our research phase, we asked multiple vendors if we could borrow up to 30 devices for testing over a 60-day period. 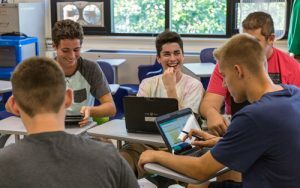 Consider how you want students to use the device and how your IT infrastructure may need to change to complement your new technology throughout the building. We made sure that our kids could access the internet in commonly shared spaces such as our courtyard and cafeteria. 5. Train early and often. With careful planning, prepping, and training, our teachers have achieved a 90-percent success rate with using the new technology. There are some methods in the article that worked for this district. 6. Be flexible and stay on track. Nothing is perfect. Expect some missteps because they’re going to happen. Best advice? Be proactive whenever possible. Make sure you have extra tools and resources at the ready: extra chargers, backup styluses, and support staff in as many classrooms as possible. 7. Choose a technology partner. Rolling out a new tech plan can be intimidating, so choose the technology provider that’s less of a vendor and more of a partner. After our 2+ years of researching, testing, and prepping, we chose the technology partner that made our small team feel large. The information fro this post was taken from an article by Cheri Burke in eSchool News, follow this link for more details and the complete article.